Did you know that there is a print shop that does not utilize any technology? When I say no technology, I mean absolutely no technology when working with customers. They do notallow potential customers to contact them via email. All work is done through verbal interaction. All proofs are created by hand. This print shop is none other than Hatch Show Print in Nashville. 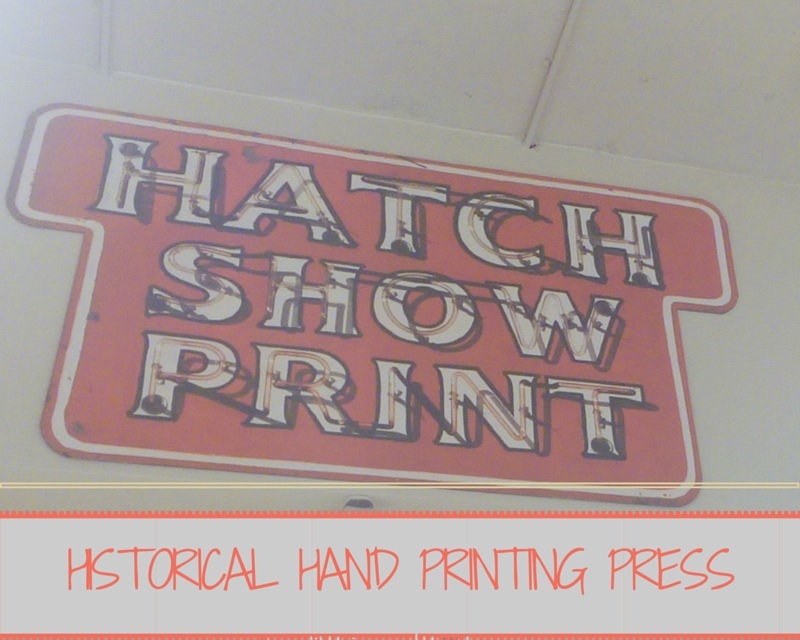 Hatch Show Print has been in operation since 1879. Our visit to Hatch Show Print which is located in the Country Music Hall of Fame in Museum was one that was filled with history. It was a nice change from our regular history program. Letter pressing using blocks originated in Asia. The first letter pressed book was the Guttenberg Bible. The first print job by the Hatch brothers was a handbill announcing Rev. Henry Ward Beecher who was Harriet Beecher Stowe's brother. The art of letter pressing has played a role in society since it made its grand debut. When I think about how the Bible was preserved and printed faster through this process, I can't help but to think of the importance of the advances in technology. It's easy at times to not think about how past inventions have made present technologyand information possible. So what is letter pressing? It's very similar to the letter stamping method that I use on the jewelry that I design. Letter pressing involves wooden letter stamps that have been hand carved into the type or font that will be used to create the words. Each letter is placed in a guide of sorts along with furniture ( it protects the white space from being effected) and rules (the borders) to create the words and designs that we see on the posters. Once the letters have been placed, ink is applied to the rollers or to the stamps by hand. This all depends on the artist who is creating the work. What makes Hatch Show Print so cool? I think it's pretty awesome that each layer of color that is visible in a Hatch poster was printed one at time. Each poster that is created in the shop is printed one at a time. The typeset that is used today all comes from the 1950s or earlier. Since the death of Will T. in 1952, the designers have not carved any other letter fonts although they do still carve images. The shelves that hold many of the stamps were created from stamps that are no longer being used. There is history all throughout the shop. If you're ever in Nashville, I highly recommend visiting Hatch Show Print. It's truly, "preservation through production." Have you heard of or visited Hatch Show Print?